I Want My 'Doctor Sahib' Back: Where's The Human Touch In Healthcare? After an arduous billing process and a long wait, when we were graced with the GP's presence, my mother started speaking eagerly. But even before she had described her symptoms, the GP was already writing the new medication -- "I think you should change your BP medicine. Try this..." I couldn't stop myself. "But you haven't even measured her BP. You haven't used your stethoscope. You haven't even heard her history." Bollywood movies, old and new, defined my childhood in the '70s. Apart from the likeable hero, pretty heroin and the hateful villain, I remember a gentleman with a black briefcase called the "Doctor Sahib". He was trusted by the whole family. From minor fever to heart attacks, he dealt with everything. Adept at human psychology, he could counsel or reprimand as a friend, give placebos, or even suggest a vacation at a hill station. He happily obliged with home visits. 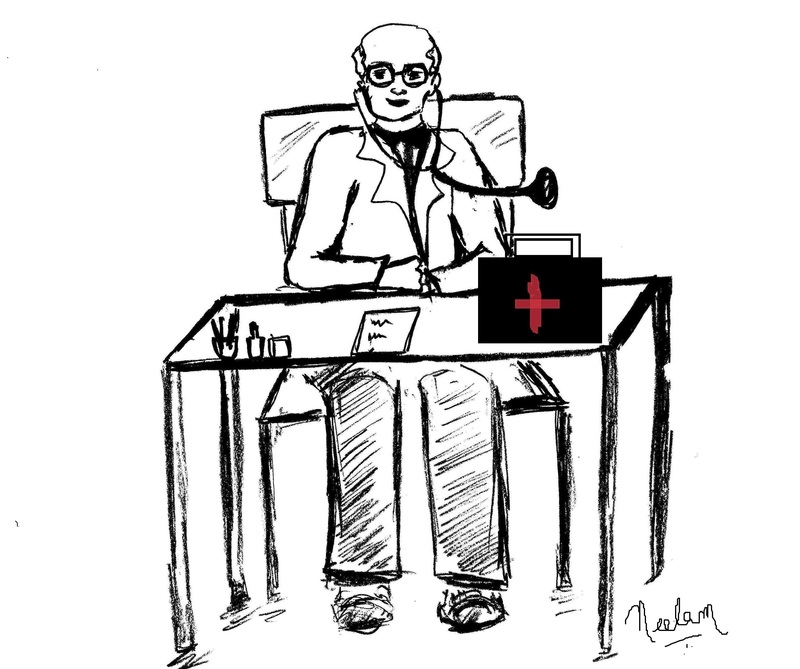 He was simply a doctor and not a GP (general physician) or a specialist. Even in real life, when we kids fell sick or got injured, the person our parents took us to was a doctor first and a specialist later. A few actions were routine - using the stethoscope, checking the tongue, pulse, BP and then as needed, asking one to lie down for further examination. The speed of prescription dispensing has always intrigued me. Is it indeed so easy to understand the complexities of a human body and mind? Fast forward to the 2000s. The roles reversed, I had to take my mother to a GP. She was suffering from headaches and flushed ears. A renowned hospital was nearby, so I considered it to be a wise choice. After an arduous billing process and a long wait, when we were graced with the GP's presence, my mother started speaking eagerly: "...Don't know if my BP has gone up, I am feeling..." Even before she had described her symptoms, the GP was already writing the new medication -- "I think you should change your BP medicine. Try this..."
I couldn't stop myself. "But you haven't even measured her BP. You haven't used your stethoscope. You haven't even heard her history." Embarrassed, he perfunctorily went through the motions and gave us the prescription. This was not an isolated case. The speed of prescription dispensing has always intrigued me. Is it indeed so easy to understand the complexities of a human body and mind? I got my answer a few years later when I met a GP, highly recommended by a friend. I met him against the popular wisdom of seeing a specialist for my knee pain. He tried to understand the history and nature of the pain along with my lifestyle -- nature of work, travel, eating habits. Then unexpectedly, he put me through a physical drill -- sitting down on a very low stool and then getting up, standing on one leg, raising myself on my toes, and so on. He was asking questions and observing closely. Finally, he stunned me with a strange question: "Have you always weighed this much?" [A] holistic analysis, keen observation and judgment... are becoming increasingly rare. Is he hinting that I am fat? Despite the "unaccommodating trouser incident" that week, I still looked fit and qualified for the normal category of the BMI (Body Mass Index). Grudgingly, I responded, "No, I used to be very thin--actually underweight--until recently. I have put on 10kg in the past year." The doctor nodded and then moved on to explain, "It looks like your legs have had to suddenly bear 20% more weight than they have ever done before. To top it off, your thigh muscles are weak... hence, your knees are feeling the pressure. I will teach you some exercises that you need to do religiously, wear flat shoes and use a good knee support for long walks. Probably your feet don't touch the floor in the airplane; use your bag as leg support during flights. Try reducing your weight a bit and we will review after six weeks to decide future course." I continued my follow-ups with the same doctor and recovered fully. This was the perfect example of a holistic analysis, keen observation and judgment, which are becoming increasingly rare. For reference, the specialist I met for a second opinion had suggested an arthroscopy, a minimally invasive surgical procedure. Patients' incentives are also misaligned -- a hospital stay is reimbursable by insurance whereas a doctor's consultation is not under most plans. In India, there is a growing demand amongst medical students to increase the number of specialist seats. Beyond prestige and the need to address changing disease patterns, the stark difference in earnings can't be ignored. In my case, the GP spent almost an hour for the correct diagnosis and saved me from an expensive, invasive procedure for his standard fee. He would have been better off dispensing prescriptions to four patients in that time. The same hour would have yielded an order of magnitude higher for a specialist -- through surgeries, complex test procedures and so on. Why shouldn't the best try to specialize then? Patients' incentives are also misaligned -- a hospital stay is reimbursable by insurance whereas a doctor's consultation is not under most plans. Many patients are happy to go with the purported reimbursable quick fix, rather than spend out of pocket for a treatment that would require serious lifestyle changes. Attitudes also matter -- while spending ₹1000 for a beauty package is fine, a similar amount for a doctor's fee is considered exorbitant. It's a vicious cycle -- patients will not be willing to pay more for a poor quality interaction and we can't upgrade the quality until the economics become sensible. The "SPEED" bug that I mentioned in my earlier article, will continue to drive quick patient turnaround. Unfortunately, the value of human interaction and judgment can't be replaced with machine-like speed and data from plethora of tests. The system cost is much higher -- financially and emotionally -- if we try to optimize individual objective functions under wrong constraints. For a patient, this is a bad outcome. [T]he value of human interaction and judgment can't be replaced with machine-like speed and data from plethora of tests. If we continue to rely on the tag of "noble profession" to be enough for the doctors to invest time for holistic advice, it will become even rarer. At the same time, profit motive should not violate the boundaries of transparency and ethics. Holistic primary care is the foundation on which specialties need to rest. Attitudes and incentives of patients and insurers also need to be realigned. I don't expect the filmi "all-in-one Doctor Sahib" to become a reality, but at the minimum I want to see a good GP in all the specialists. I hope that we can strike the right balance between nobility and profits. Written by the author of the book "The Ninjja Sutra- Surviving the healthcare web". Views expressed are solely of the author.